Crafted from pewter and poplar wood, this desktop piece will be a hit with anyone who loves a good scoop. 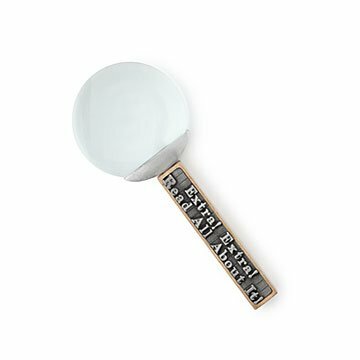 Breaking news: This magnifying glass will be a hit with anyone who loves a good scoop. Crafted from lead-free pewter and poplar wood, the handle is a nod to newspaper typeset print plates and the days of enterprising paperboys. It's sturdy, too, so keep it on your desk to read important documents, letters, or just the takeout menu. Made in Rhode Island.